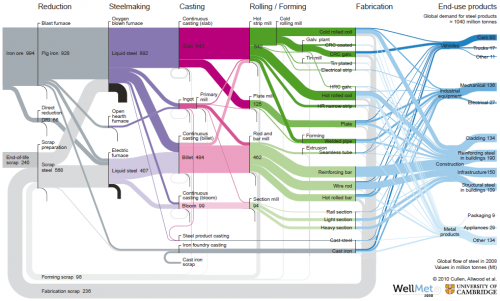 Checking further on the authorship of the Sankey diagram I presented in this post, I came to the LCMP website at the University of Cambridge. LCMP? Yes … Low Carbon and Metals Processing. The engineering research group around Julian Allwood and Jonathan Cullen have three large research themes: WellFormed, WellMet2050, and WellMade. The below Sankey diagrams are from the report ‘Going on a metal diet’ by Allwood, Cullen et.al. published within the WellMet2050 research theme. Unfortunately these two mentioned working papers are not (yet?) available on the website. These really fantastic Sankey diagrams have been compiled from different data sources. I thought I’d share them with you. Please visit the LCMP website and read about their other exciting projects.